So I preordered the game today hoping I could run on my mac using the application wine. Unforunately it immediately crashes. The official installer from the humble store immediately crashes upon opening and seeing the UDK screen. I did manage to get my hands on a set of files for the game already installed. But this also crashed. But I could get past the installer to the actual game start-up. This time it says "EULA could not be found, aborting install." I will be trying to get the game running on a friends pc, then transfering the files to my mac. Will post results back here. Anyone successfully got it to run using wine? Or anyone have any tips?? Thanks for stopping by, whosrakim! Assuming you're the same guy who just sent me an email about Wine+Mac+ToG+EULAs, then you're the first to go down this road that I know of. I'll continue digging around a little to see if I can find any more clues about the issues over on UDN and with various other UDK developers, and will post anything here if I find out anything. Hopefully others will do the same. Welcome to the Tog community nonetheless! So I did some fiddling around, and got the exe to install onto my mac. The key is to go into the emulated control panel in wine. From there its Add/Remove Programs and select the exe. That should do it for the install. Another problem though. After The install, upon running the program, I get a black screen, a blip of sound then nothing. I assume the program may be too much and causes a crash. But not sure. Gonna keep fiddling and see. Managed to get the game onto a friends pc. Unfortunately I think the game is too much for my friends Nvidia card. It was very stuttery, and I didnt manage to get past the intro credits. For what its worth given the earlier revelation, I believe the game should be able to run on newer macs, as I believe what causes my crash is more likely due to my spec than the OS. Wow man..sounds like a string of bad experiences..I have no idea what could cause the blackscreen+soundblip+crash...the game isn't incredible taxing on the graphics card--though the difference between a 2008 era card and a 2010 era Nvidia card *really* become apparent in the game when a lot of mines/firespheres are on the screen. Otherwise it's really more taxing on the CPU, due to the amount of bullets and such. So.. now I'm curious what sort of specs your friend's machine has... I've been trying to identify what people should expect performance wise as an ABSOLUTE minimum, and it sounds like your friend is below that line. Can you tell me his machine's CPU/OS/Graphics Card/and space-free on the harddrive? I've found one rare issue where a simple restart of the machine cleared up the majority of the performance issues...so if your friend is the type to not restart often then that might help. Also, as weird as it seems, the intro menu can have a worse frame rate on some machines than the game itself. I'm not quite sure what's going on there yet. So Im back with some anecdotal evidence of how to get Tower of Guns running optimally on an old MacBook pro. Here's my spec. Pretty old, with some minor upgrades. Now using this laptop running TOG under wine, it just would not work. It may for some newer macs, but Im not sure. What I ended up doing is installing Windows 7 via Boot Camp. What this did, was not only allow me to actually play ToG, but at a fairly decent framerate too. This went for all games, whether there was a native mac client, or through wine, every game I play has gotten some performance increase due to switching from OSX to Windows. This is where things get hectic. The game was playable under Boot Camp, getting past the first three rooms is fine, but fighting any boss turns into a slideshow. To remedy this I turned to overclocking my gpu, now made possible by my switch to windows. I use MSI Afterburner to overclock my Nvidia card by 80 mhz. This leads to better framerates and performance. Lastly, I use Razer Game Booster to keep any bystanding apps intrusion at a minimum. Hey, nice guide, thanks for that. I don't have a Mac, so I can't really compare, but my x86 system is comparable to yours hardware-wise. You didn't specify a video card, but mine is a GF9500GT; one step short of a doorstop these days. I'm concerned that you should even need to think about OCing your CPU. 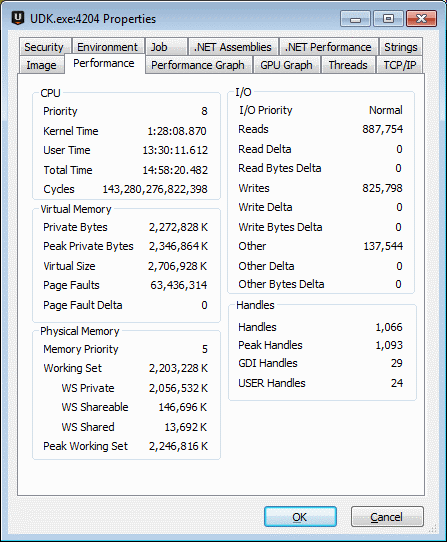 I've done some checks and TOG seems to be far more GPU than CPU bound. On mine I get 60fps fairly constantly, and if I nobble the graphics engine I can lock it out at about 100fps, no problems. On my system I just finished a run to almost level 50, and had almost no slow downs until about level 40, and this is because we're not actually supposed to last that long and TOG is holding onto too much memory. 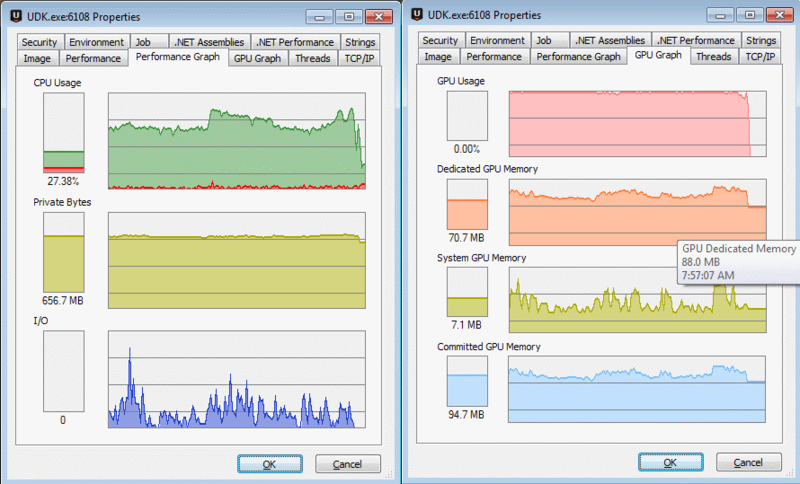 As can be seen, TOG isn't even maxxing out one of my cores, but is redlining the GPU. I think your system could benefit far more from config tweaking (guide coming soon!) than OCing, but that's just mho. To try it out drop the console in game and type STAT FPS to show your current FPS. Now type SHOW POSTPROCESS. This is a one-time general flag that turns off a bunch of stuff. You should see your fps rise dramatically. Im not quite sure what u mean by drop console. I tried typing those commands into command prompt. But I don't think that's what u meant. wow thanks for the writeup whosrakim! That's awesome! I'll be linking to and using this thread for summary now whenever anyone asks me the Mac question. I'm glad you got it running. Also, I'm surprised to hear about the GPU hit, Sgt. In general the game is GPU light, but thats for more recent cards..the difference between a 9500 and a my 275..which is also pretty old.. is pretty huge, even though they were only like.. a year or so apart I guess. Also, disabling post process suggests that its SPECIFICALLY pixel/shader complexity that is taxing to your card, rather than drawcalls or triangles. That's good to know, I guess. Does the game performance dip a lot when using the mine-gunmod for you?